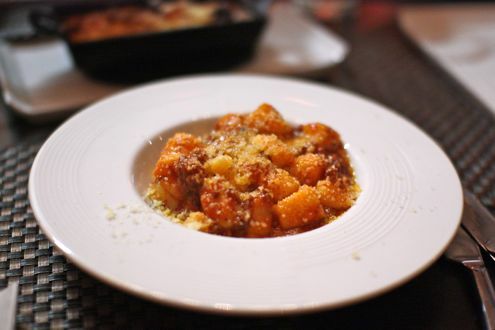 When Casa Nonna shuttered in the spring of 2012, the District not only lost a great, reasonably priced Italian eatery located in the heart of Dupont Circle, but it also displaced Chef Amy Brandwein. Brandwein, who was a disciple of famed Italian chef Roberto Donna, has reunited with her mentor with the opening of Alba Osteria in Mount Vernon Square. Rachel and I, who are big fans of Donna’s work at Al Dente, went out to dinner at Alba Osteria last weekend with a few friends. Unlike Al Dente, Alba Osteria’s menu focuses on the Piedmont region of Italy, with a heavy emphasis on rich cheeses, filling pastas, and a wide selection of antipasti. 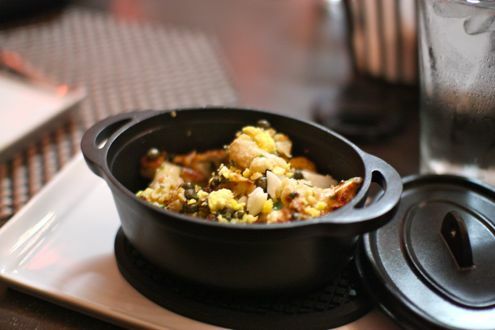 In fact, there are more than a dozen small plates to choose from on top of a handful of soups and salads. 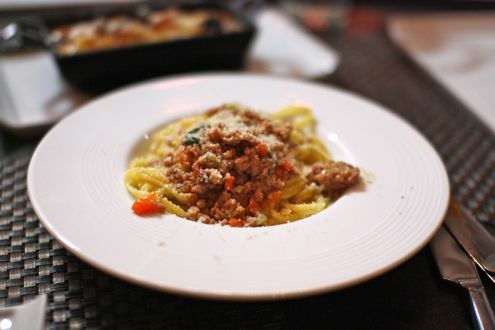 Alba Osteria also features six or so freshly made pastas that can be ordered as a small dish or entrée-size as well as a trio of entrees such as beef tenderloin and rabbit. Furthermore, there’s over a dozen wood-fired Neapolitan-style pizzas to pick from on the reverse side of the menu. 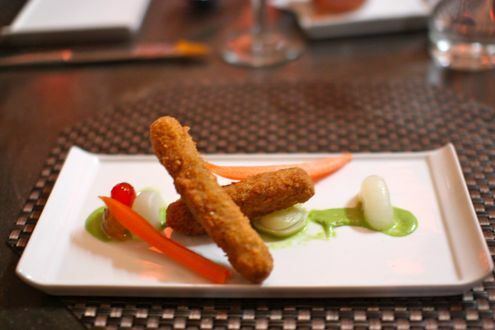 And to top things off (literally), you can add duck liver to any dish for twelve dollars. With six people in our party, we decided to try a variety of Piatti Caldi as well as a handful of pastas. Oh, and a couple bottles of wine for good measure. 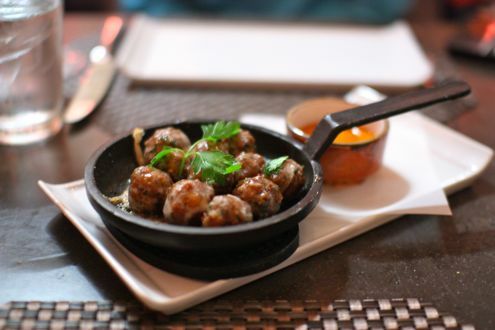 We started the evening off with Birille di Carne, tiny meatballs with a hint of mint, served in a cast-iron skillet and accompanied with a Piedmontese red sauce. It wasn’t your typical marinara sauce as it was also prepared with red peppers and vinegar, which I rather enjoyed as it was a subtle departure from classic Italian fare. Next was the Ratatuia Piemontese, a Piedmont take on ratatouille. Prepared with cauliflower, cardoons, squash, garlic, onion, and an anchovy sauce, both Rachel and I remarked how much we liked the blend of flavors on the kitchen’s rendition of this French classic. 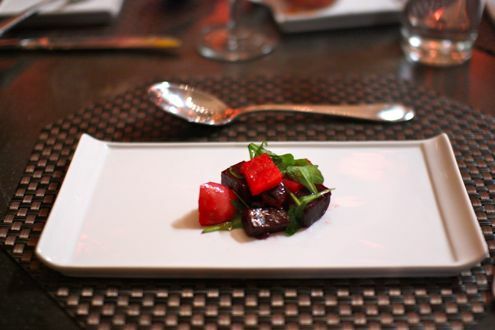 The Barbabietole was a beautifully arranged beet salad with arugula, pistachio, Pecorino cheese, and balsamic vinaigrette. The Batsoa, or fried pig’s feet, were topped with pickled vegetables, accompanied with Mostrada, and situated under a bed of salsa verde. It was an interesting flavor combination to say the least. 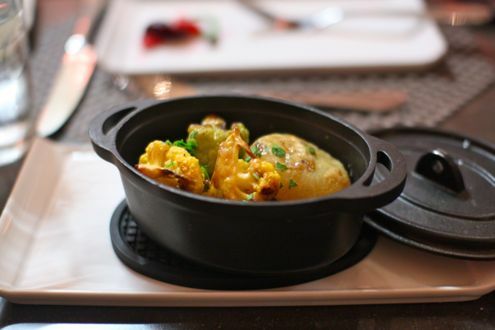 We also split the Cavolfiore alla Cavour, which was prepared with grilled cauliflower, Parmesan, anchovy, and egg. The table’s favorite small plate of the evening goes to the Fegatini e Porcini – sautéed chicken livers blended in a Marsala wine sauce and Porcini mushrooms, all under a bed of rich and creamy polenta. After we finished our antipasti, we then moved onto the pasta course by sharing a handful of dishes amongst the table. The first was the agnolotti al brasato, and it was outstanding. 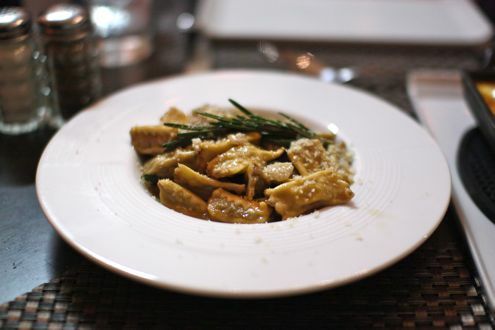 Stuffed with braised beef and lightly adorned with beef jus, shaved bone marrow, and Parmigiano Reggiano, the agnolotti was cooked al dente and was a very hearty, rewarding selection. My younger brother ordered the seafood special, which consisted of mussels, shrimp, and squid in a white wine and garlic red sauce, but it was the squid ink spaghetti that really stood out. The Cannelloni alla Barbaroux was one of the richest items we ordered that evening. Stuffed with veal, beef, Bescamella, and Parmigiano Reggiano, this is one dish you might want to share given how heavy it was. The tajarin with veal ragu was also excellent, but what’s really remarkable is that the kitchen uses 42 egg yolks per kilo to produce this ribbon pasta! The Gnocchi Verdi was my personal favorite. The small, pillowy dumplings were stuffed with spinach and potato and dressed with a succulent sausage ragu. 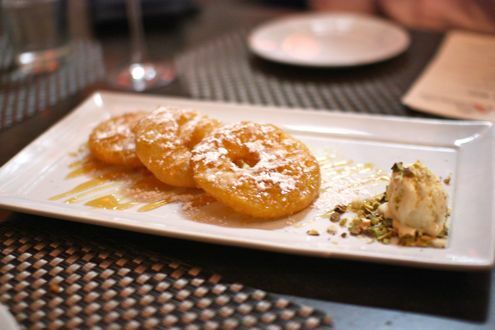 For dessert, we had the Frittelle di Mele and Polenta Bianca. The former was a fried, sliced apple dipped in rum batter, drizzled with caramel, and served with a scoop of vanilla gelato sprinkled with sage. As good as the Frittelle di Mele was, the Polenta Bianca was even better. 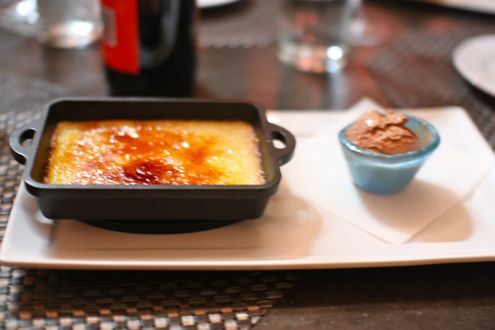 Served in a style similar to that of crème brulee, the snow white polenta was topped with a thin layer of crunchy caramel and accompanied with one of the best scoops of chocolate gelato you’ll find in the District. Easily one of the best dishes of the night. 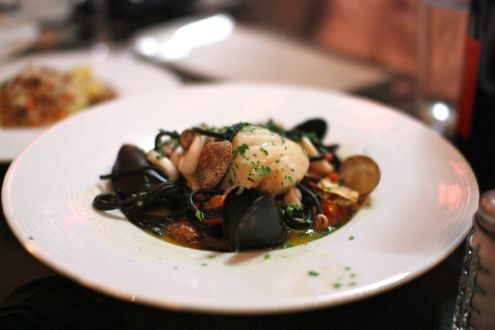 Alba Osteria is a terrific addition to the Mount Vernon Square neighborhood and offers a taste of Italy that’s substantially different than what you’ll find at other osterias in the area. 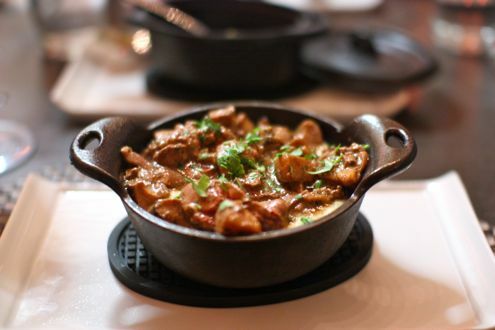 On top of that, the prices are very reasonable and makes for a fun night with a group so everyone can sample the extensive list of dishes on the menu. 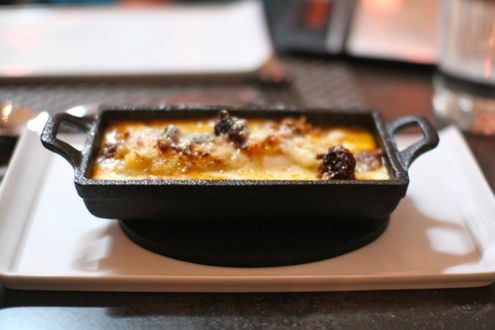 Just be sure you finish your meal off with the Polenta Bianca.